DJ Campbell grabbed a second-half double as Blackpool made Sunderland pay for a host of missed chances to secure a fifth away league win of the season. Asamoah Gyan, Darren Bent and Danny Welbeck all squandered good openings and visiting goalkeeper Richard Kingson made a number of excellent stops. Welbeck, Bent, Jordan Henderson and Gyan all spurned at least two opportunities apiece as the hosts dominated possession and territory. Henderson's best strike on goal saw goalkeeper Kingson uncomfortably fumble his measured shot around the post. But Gyan missed the best openings, shooting into the side-netting after showing good strength when chasing a long pass, and then hopelessly miskicking from six yards out. Campbell, in particular, looked bright and sharp and one clever turn on the edge of the box after a breathtaking run from first-half substitute Phillips - on for the injured Elliott Grandin - almost produced a great counter-attacking goal. Luke Varney also tested home keeper Craig Gordon and Campbell whistled a shot narrowly wide after a purposeful run. 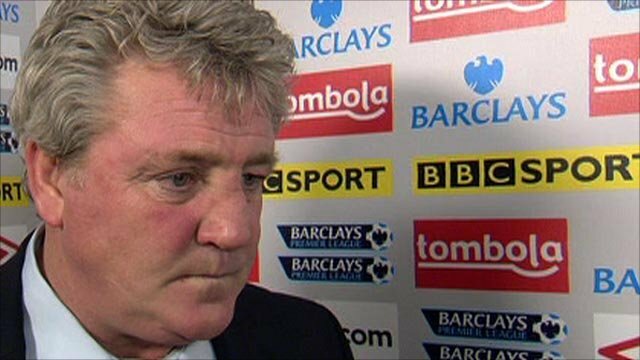 But because of their dominance in the middle of the park and the sheer volume of chances, Sunderland boss Steve Bruce must have been staggered and sickened in equal measure when the visitors took the lead five minutes after the break. Clever interplay on the right allowed Neal Eardley to deliver the ball into the box and when his cross was flicked on by Evatt, Campbell was on hand to fire home from 10 yards. The Seasiders could have doubled their lead with Gary Taylor-Fletcher almost converting a far-post cross and Craig Cathcart somehow missing a free header when it seemed easier to score. Substitute Steed Malbranque's strike was beaten away by the over-worked - if not entirely convincing - Kingson, and the keeper also did well to keep out Henderson's 18-yard strike. The best chances, however, came in the last 10 minutes. Bent then came the closest to a home goal all afternoon with a stunning 25-yard free-kick that crashed back down off the bar and to safety. And Blackpool made the game safe in injury-time when the impressive Phillips tricked his way into the box and crossed for Campbell who smashed the ball home via the bar. 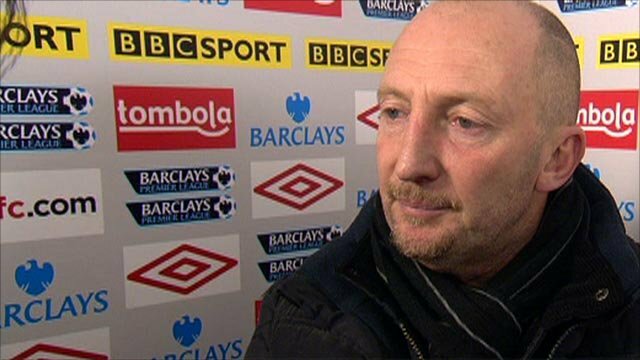 Blackpool boss Ian Holloway was incensed that Titus Bramble - an early replacement for the injured Nedum Onuoha - was only shown a yellow card for a late challenge. However nothing could spoil another wonderful day for a side who are in eighth spot in the Premier League table. They sit just two points behind Sunderland but because of their three recent postponements they also have three games in hand. 94:09 The referee brings the game to a close. 90:00+3:13 David Carney is ruled offside. Indirect free kick taken by Craig Gordon. 90:00+2:21 Luke Varney fouled by Titus Bramble, the ref awards a free kick. Free kick taken by Stephen Crainey. 90:00+2:21 Booking Titus Bramble is cautioned by the ref for unsporting behaviour. 89:36 Assist on the goal came from Matt Phillips. 89:36 GOAL - Dudley Campbell:Sunderland 0 - 2 Blackpool A goal is scored by Dudley Campbell from inside the six-yard box high into the middle of the goal. Sunderland 0-2 Blackpool. 88:41 Inswinging corner taken by Jordan Henderson, Headed effort from deep inside the area by Danny Welbeck misses to the left of the goal. 86:42 The assistant referee signals for offside against Steed Malbranque. Indirect free kick taken by Richard Kingson. 83:49 Corner taken right-footed by Jordan Henderson, clearance made by Craig Cathcart. 83:30 Ahmed Elmohamady takes a shot. Blocked by Neal Eardley. 83:10 Darren Bent takes a shot. Save by Richard Kingson. 81:20 Lee Cattermole takes a shot from 18 yards. Richard Kingson makes a comfortable save. 80:01 Substitution David Carney joins the action as a substitute, replacing Gary Taylor-Fletcher. 80:01 Substitution Keith Southern is brought on as a substitute for Ludovic Sylvestre. 79:22 Inswinging corner taken by Jordan Henderson from the left by-line played to the near post, Headed effort from inside the area by Danny Welbeck misses to the right of the target. 78:35 Ahmed Elmohamady takes a shot. Comfortable save by Richard Kingson. 76:39 Foul by Kieran Richardson on Dudley Campbell, free kick awarded. Direct free kick taken by Neal Eardley. 75:43 Short corner taken by Jordan Henderson from the right by-line. 75:02 Short corner worked by Jordan Henderson. 73:20 Dudley Campbell concedes a free kick for a foul on Anton Ferdinand. Direct free kick taken by Anton Ferdinand. 72:04 Shot by Lee Cattermole from just outside the area goes over the net. 71:53 Darren Bent crosses the ball, clearance by Stephen Crainey. 70:42 Steed Malbranque has an effort at goal from 18 yards. Comfortable save by Richard Kingson. 69:57 Steed Malbranque takes a shot. Brilliant save by Richard Kingson. 69:42 The ball is sent over by Ahmed Elmohamady, blocked by Craig Cathcart. 69:22 The ball is delivered by Steed Malbranque, clearance by Ian Evatt. 67:40 Inswinging corner taken by Jordan Henderson from the right by-line, Shot by Danny Welbeck from deep inside the penalty area misses to the right of the target. 67:17 Outswinging corner taken by Jordan Henderson from the right by-line played to the near post, Matt Phillips makes a clearance. 67:05 Ahmed Elmohamady takes a shot. Blocked by Stephen Crainey. 65:53 The assistant referee signals for offside against Asamoah Gyan. Richard Kingson takes the indirect free kick. 65:53 Substitution Steed Malbranque joins the action as a substitute, replacing Asamoah Gyan. 65:32 Phillip Bardsley takes a shot. Richard Kingson makes a save. 63:25 Corner taken right-footed by Ludovic Sylvestre, Craig Cathcart has a headed effort at goal from close in which goes wide right of the target. 63:19 David Vaughan delivers the ball, clearance by Phillip Bardsley. 62:13 Jordan Henderson takes a shot. Blocked by David Vaughan. 61:20 Shot from 20 yards from Jordan Henderson. Comfortable save by Richard Kingson. 60:20 A cross is delivered by Matt Phillips. 59:23 Darren Bent sends in a cross, Craig Cathcart manages to make a clearance. 58:27 Free kick awarded for an unfair challenge on Lee Cattermole by Matt Phillips. Anton Ferdinand takes the direct free kick. 57:36 Substitution (Sunderland) makes a substitution, with Kieran Richardson coming on for David Meyler. 57:16 Jordan Henderson produces a cross, Effort from deep inside the area by Asamoah Gyan misses to the right of the goal. 55:30 The referee penalises Danny Welbeck for handball. Richard Kingson restarts play with the free kick. 54:23 Headed effort from inside the box by Darren Bent misses to the right of the target. 53:34 Shot by Jordan Henderson. Stephen Crainey gets a block in. 52:13 Shot from outside the area by Matt Phillips misses to the left of the goal. 51:44 Effort from 18 yards by Jordan Henderson. Comfortable save by Richard Kingson. 51:12 Lee Cattermole takes a shot. Comfortable save by Richard Kingson. 49:37 Assist on the goal came from Ian Evatt. 49:37 GOAL - Dudley Campbell:Sunderland 0 - 1 Blackpool Dudley Campbell gets on the score sheet with a goal from deep inside the penalty box to the bottom right corner of the goal. Sunderland 0-1 Blackpool. 49:20 David Vaughan decides to take the corner short. 49:11 Matt Phillips sends in a cross, clearance made by Phillip Bardsley. 47:36 Curled right-footed shot by Danny Welbeck. Richard Kingson makes a comfortable save. 46:35 Header by Asamoah Gyan from deep inside the penalty area misses to the left of the target. 45:00+2:52 It is the end of the first-half. 45:00+2:15 Unfair challenge on Luke Varney by Darren Bent results in a free kick. Direct free kick taken by Richard Kingson. 45:00+1:02 Unfair challenge on Ludovic Sylvestre by David Meyler results in a free kick. Free kick taken by Neal Eardley. 45:00+1:02 Booking David Meyler receives a yellow card. 45:00+0:01 Free kick awarded for a foul by Luke Varney on Danny Welbeck. Ahmed Elmohamady restarts play with the free kick. 44:26 Shot by Asamoah Gyan from deep inside the penalty area misses to the left of the target. 42:16 Asamoah Gyan produces a right-footed shot from just outside the box that goes wide right of the target. 41:22 Shot by Matt Phillips from deep inside the penalty area misses to the left of the target. 40:29 Outswinging corner taken by Jordan Henderson from the right by-line, Darren Bent takes a shot. Neal Eardley manages to make a clearance. 40:12 Corner from right by-line taken by Jordan Henderson. 39:56 Jordan Henderson takes a shot. Comfortable save by Richard Kingson. 39:02 Danny Welbeck fouled by Gary Taylor-Fletcher, the ref awards a free kick. Jordan Henderson delivers the ball from the free kick right-footed from left wing. 37:44 Effort from the edge of the area by Dudley Campbell goes wide of the left-hand upright. 37:16 Unfair challenge on Matt Phillips by Anton Ferdinand results in a free kick. Free kick taken by David Vaughan. 35:19 Dudley Campbell takes a shot. Save by Craig Gordon. 34:32 Jordan Henderson produces a cross. 33:41 Darren Bent has an effort at goal from just inside the box that misses to the left of the target. 31:49 Shot by Darren Bent from deep inside the penalty area misses to the right of the target. 30:54 Substitution Titus Bramble joins the action as a substitute, replacing Nedum Onuoha. 29:43 Dudley Campbell has an effort at goal from deep inside the area missing to the left of the target. 28:25 Shot by Luke Varney from 18 yards. Save made by Craig Gordon. 27:48 Effort from the edge of the area by Jordan Henderson goes wide of the left-hand upright. 26:18 Asamoah Gyan has an effort at goal from close range which goes wide right of the target. 24:44 Darren Bent is caught offside. Free kick taken by Richard Kingson. 22:03 A cross is delivered by Danny Welbeck, save by Richard Kingson. 18:55 Substitution Matt Phillips joins the action as a substitute, replacing Elliot Grandin. 17:48 Jordan Henderson delivers the ball, David Vaughan gets a block in. 16:53 The official flags Jordan Henderson offside. Richard Kingson takes the indirect free kick. 16:11 The referee blows for offside against Darren Bent. Craig Cathcart restarts play with the free kick. 10:54 Close range shot by Darren Bent goes wide of the right-hand upright. 9:28 The ball is crossed by Ahmed Elmohamady, clearance made by Craig Cathcart. 8:03 Danny Welbeck is ruled offside. Richard Kingson takes the indirect free kick. 5:46 Lee Cattermole gives away a free kick for an unfair challenge on Luke Varney. Free kick taken by Richard Kingson. 2:49 Effort from the edge of the box by Danny Welbeck goes wide of the right-hand upright. 1:54 The ball is crossed by Ahmed Elmohamady, clearance by Craig Cathcart.